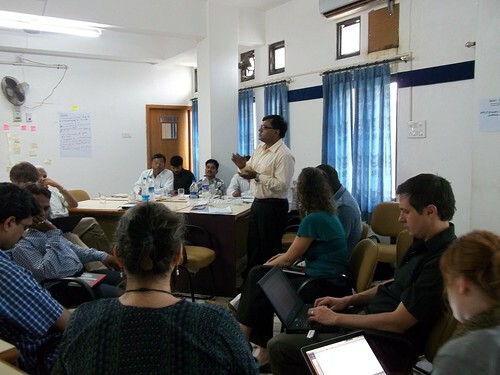 From 2 to 6 July, the project teams from Jharkhand and Rajasthan in India and from Mozambique gathered in Udaipur for a reflection and learning workshop. The objective of the workshop was to share project progress and approaches across the two countries, to distill learning on processes and outcomes thus far and to identify potential communication products and develop a strategy around these. Communication support has been essential for this event and will remain critical for the rest of the project. Three ILRI communications staff attended the meeting: Tezira Lore (communication officer for the project, based in Nairobi), Kara Brown (communication intern) from the ILRI Delhi office and Ewen Le Borgne (knowledge sharing and communication specialist) from the ILRI Addis Ababa office. Organizing a session on communication work so far and another one on developing a communication plan for the next six months. In parallel, and crucially, supporting the proper engagement process in innovation platforms and within the teams. This approach highlights the importance of working with the communication team early on. Indeed, the earlier and the more consistently communication specialists work on a project, the more likely a) each and every formal output is available, accessible and understandable, b) processes are documented and shared to inform planning and reporting on a regular basis, c) all internal staff and external partners are aware of the project progress, process and outputs and feel part of a larger whole, d) conversations (both online and offline in e.g. workshops and conferences, but also team and innovation platform meetings) are well prepared, facilitated and documented to ensure everyone feels listened to and can find traces of these conversations for future work. Involving the communication team late requires a lot of extra work for everyone, work that could be better used for solving the original objectives of the project and for trying to reach some impact.